I found this recipe on Pinterest and adapted it a bit from the one Damn Delicious posted. Hubby had his with a fried egg on top, and really enjoyed it. Runny egg yolks are not my thing without toast, so I skipped the egg and enjoyed mine with a sprinkling of fresh grated parmesan cheese. The egg definitely adds protein though – so to boost it if you don’t want eggs, try a legume like chickpeas or cannellini beans. The Boy had his without egg and cleaned his plate, so even good for picky eaters. My kids both love roasted asparagus, though – so that makes things easier! Serve with a green salad and garlic bread – perfect quick-cooking, no plan meal. 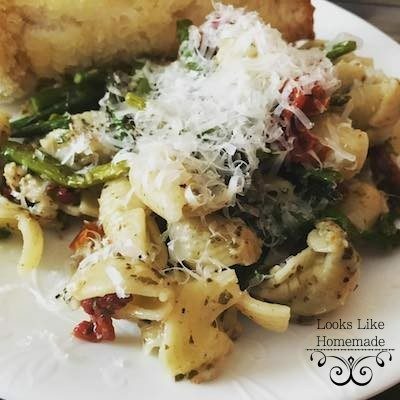 Excellent Pesto Pasta - great meat-free and fast cooking dish. Perfect for late night or days you didnt plan dinner. 1/4 C julienned sun dried tomatoes. I drain these and press between paper towels. If you use dried reconstitute in warm water for 15 minutes & drain before slicing. Preheat oven to 425 degrees F. Line a baking sheet with foil. Trim ends off asparagus & spread over sheet Toss with olive oil gently and then add salt and pepper to your taste. Roast for 18 minutes. In a large pot of boiling salted water, cook pasta; drain well. When asparagus is done, cool slightly and cut into 1" pieces. 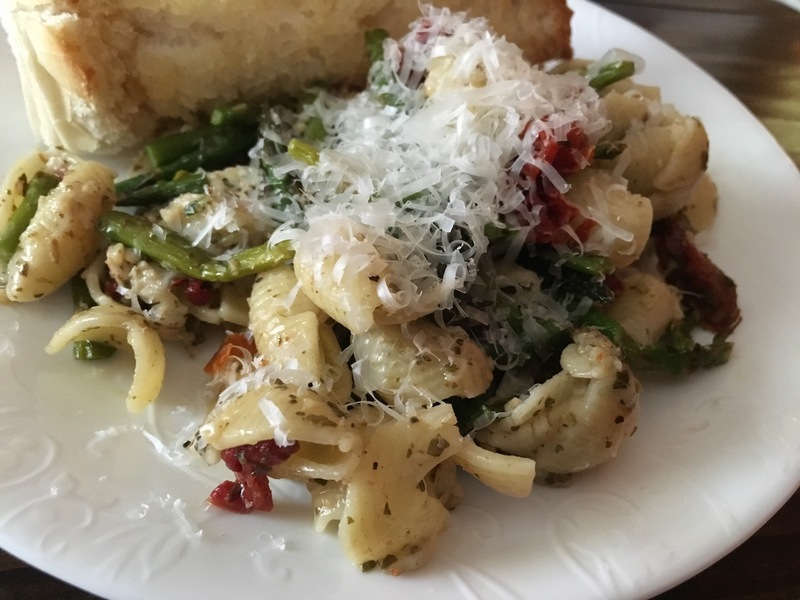 In a large serving bowl, combine pasta, asparagus, pesto, sun dried tomatoes and mozzarella. Serve immediately with a fried egg, if you like them. Tastes amazing without as well.